RIO DE JANIERO -- In just its second year, the Rio Open has established itself as the tent-pole of the ATP’s so-called “Golden Swing,” the four-week stretch of clay-court events in South America. IMG, along with IMX (its joint venture in Brazil), won the bidding war for the Memphis Open’s ATP 500 sanction two years ago and persuaded the ATP to move the tournament to Rio. With the city hosting the two biggest international sporting events in the world in the span of two years—the World Cup and Olympics—the move made perfect sense. IMG had already found success investing in Asia as an emerging market and with the Rio Open, as well as the Miami Open, they have their sights set on Latin America. Those behind the Rio Open want to take the baton from Kuerten, the retired former world No. 1 universally known as Guga, and help usher in a new, event-based legacy in Brazil. While the Rio Open is held at the Jockey Club of Brazil, a country club near the well-to-do neighborhood of Leblón, the Olympic tennis venue is currently being constructed in the relatively newer district of Barra da Tijuca. Barra, which sits in the western part of the city, will be the central hub of the Games. The Olympic village and most of the major venues are under construction there, meaning tennis players can look forward to actually being a part of the Olympic experience in Rio. That’s a significant contrast to the 2012 Olympics in London, where the players stayed in private housing and hotels near the All England Club, and not in the Olympic Village. Construction continues at the Tennis Centre in the Olympic Park for the Rio 2016 Olympic Games in the Barra da Tijuca neighborhood. Rio’s Olympic tennis venue will have a capacity of 18,250 across four courts. Centre Court will feature 10,000 seats—for comparison, Wimbledon’s Centre Court, Court Philippe Chatrier and Rod Laver Arena all seat around 15,000. 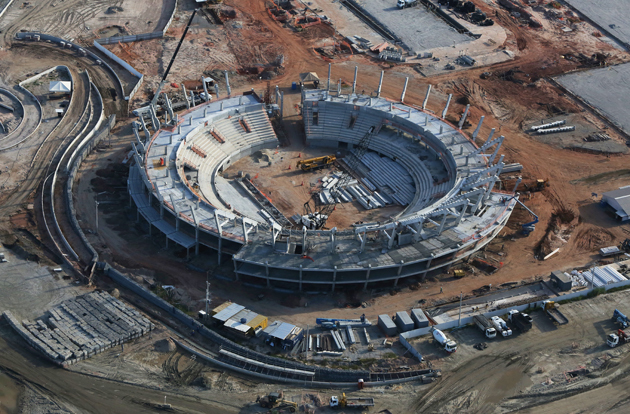 Once completed, it will be the largest dedicated tennis venue in Brazil. A temporary Court 1 will seat 5,000 and a permanent Court 2 structure will seat 3,000, with seven additional outer courts with seating of 250. Carvalho says a test event, in the form of a low-key national tournament, is scheduled for December. While Brazil and all of South America have a strong tradition and legacy on clay, the Rio Olympics will be held on hard court. Nadal expressed his surprise and disappointment with the decision. The Olympics have not been held on clay since 1992 in Barcelona, and the last two Olympics were on hard court in Beijing and grass in London. Carvalho stresses that Wimbledon was an exception. Given the Olympics’ place in the professional tennis calendar—firmly planted during the North American hard court season leading up to the U.S. Open—clay was a difficult ask. Despite their differences in venue, surface, and timing, the Rio Open is working alongside the Rio Olympics in hopes of building a better experience for everyone. Carvalho sits on the Rio Olympics organizing committee for the tennis event. Last week at the Rio Open, Rio Olympics staff helped work the tournament in order to gain experience. There’s no trial and error at the Olympics. The organizers have to get it right from Day 1, and Carvalho knows that’s a tough task. As much as the Olympics have dominated the focus and discussion of sports in Brazil, the prospect of the post-Olympic landscape isn’t far from organizers’ minds. For tennis, the increased funding produced by the Olympics is a boon, but building on that requires deliberate planning. According to IMG, the Rio Open is the cornerstone of that plan. 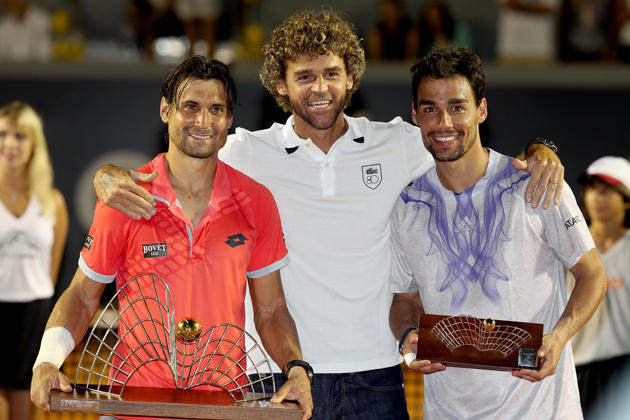 David Ferrer and Fabio Fognini with Kuerten after the final of the Rio Open. There are obvious obstacles in the Latin American market. Economic instability, both domestic and worldwide, creates investment risk, though Carvalho points out that 90% of the tournament’s sponsors last year re-signed agreements this year. Then there is the issue of culture. Says Soler, “I think that the World Cup and the Olympics have improved the culture of sport in the country. These two events will attract companies who have never sponsored any sporting events in Brazil. They’ll enjoy it, see the culture, see the people, and then they’ll say, Then what? That’s when we raise our finger and say, What about the Rio Open? We’re here every year. The Rio Open is a joint ATP and WTA event, but the women’s side has fallen well short of what the men have been able to deliver. The ATP event is a 500 level (just one level shy of the coveted ATP Masters 1000s) and has been able to attract Nadal and David Ferrer—two top 10 players—in the last two years. In contrast, the WTA tournament is an International-level event, one of the lowest designations on the WTA hierarchy. Its top seed this year was No. 12 Sara Errani, and she was the only Top 30 player in the field. Carvalho says he would love to see the WTA event get an upgrade but the move is plagued by calendar issues. The Rio Open takes place the same week as the WTA’s Premier 5 event in the Middle East, which attracts all the top-name players.